Tourist information for Shannon from Drive-Alive. Touring in Clare Limerick Tipperary by car. Tourist information for Shannon. Links to hotels in Limerick, Clare and Tipperary. 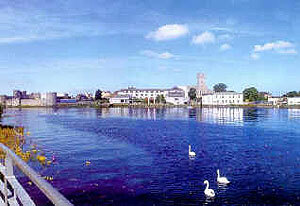 The Shannon region of Ireland comprises the counties of Limerick, Clare and the Northern half of Tipperary. County Limerick is mainly agricultural, lying to the south of the Shannon estuary. Like Tipperary, the county is blessed with a profusion of historic remains, with castles, abbeys, ancient churches and prehistoric remains at every turn. Limerick town is steeped in history, with the notable features King John's Castle, St Mary's Cathedral and the Hunt Museum. The city has enjoyed a recent renaissance, and is now a lively spot at night with plenty to do. 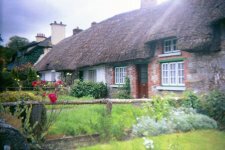 Adare, 16 km southwest of Limerick, is a pretty village with a remarkable collection of medieval buildings. Nenagh, North-East of Limerick in Tipperary, is the gateway to the popular holiday playground of Lough Derg, with boating, fishing, sailing and swimming. Killaloe is actually in Clare, on the shores of Lough Derg, and is an attractive town set against the backdrop of the Slieve Bernagh mountains. North of the Shannon is the very different scenery of County Clare, which becomes wilder and more magnificent as you proceed northwards. Shannon town was built to serve the international airport, although its hotels provide a useful stop-over. Bunratty Castle and Folk Park is close by. Cooraclare is a small town centrally placed in the rural landscape of southern County Clare, and another good location for an overnight stop if you're crossing the Shannon on the Tarbert Ferry. 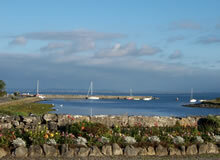 On the west coast of Clare is the town of Milltown Malbay, close to Spanish Point with its beaches and golf courses. Along the coast is the popular Irish seaside resort of Lahinch, in Liscannor Bay, close to the Cliffs of Moher, which rise vertically to a height of 203 metres. The interesting old town of Ennis is the gateway to the Burren, and is one of the many towns in the region famed for Irish music. The Bureen is a unique and spectacular limestone plateau, much of it bare "pavement", where the numerous gullies hide all manner of flora. The area is excellent for walking, and contains many prehistoric sites, chief among them the atmospheric dolmen at Poulnabrone. Lisdoonvarna is the largest town to the west of the Burren, and is another well-known for its many pubs providing Irish music. On the northern coast of Clare, with the Burren as a backdrop, is the pleasant harbour-side village of Ballyvaughan, close to some great walking and to the extensive underground passages of the Aillwee Caves.